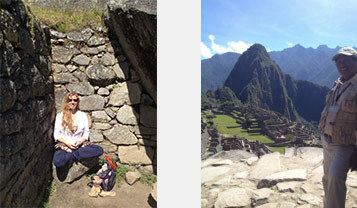 I was fortunate to spend time there with the local Peruvian people and learn some of their customs and cuisines. I especially appreciated the love the people of that area have for their land, their mountains, and the plants. They have a respect for their “panchamama” or mother earth. They understand our earth sustains us, it is a living breathing cell in the universe of life, everything that surrounds us is sacred. When making tea, they do not go to the kitchen and get a tea bag, they go to the garden and clip what herbs are in season. In making the tea they take time to honor the plant, breathing in the aroma of the leaves, then make the tea. The water at the retreat center comes from a nearby waterfall. Fresh mountain water I loved showering in it, it made my hair soft and my skin feel good. Quite different from our city water with ammonia and bleach in it . . .
View of Huayna Picchu from the seat I am sitting on (picture left) and my guide in Machu Picchu. We live in a time of transition — losing our cultures. Many of our old cultures remembered the importance of honoring the sacred and staying connected to nature. Now we spend all our days in our houses, cars, and/or air conditioned offices isolated from fresh air and nature — forgetting how important it is for us to keep our connection our panchamama. But we are also in a time of great awareness; many people are beginning to want to be more aware of Nature. In the evening as the sun sets, walk outside with your bare feet in contact with bare earth – flare your nostrils and take a deep inhale. Breathe fresh air into your lungs. Say your thanks to the universe. Dream your dreams and ask your questions. If you work in an office get outside during breaks and take in the sunshine and fresh air. It will help rejuvenate you for the rest of your work day. Open your windows! In the car even if I run the a/c I open the windows to breathe in the fresh air. In the winter time I keep a window by my bed and one by my desk cracked so I get fresh air in my house. It is not good to lock up and seal our houses as modern recommendations say. This traps toxic air in our houses and does not allow fresh air in. Go for a hike in the mountains. Eat fresh foods from local farmers. Your body will feel the love of the earth in fresh local food. Most grocery store food is void of vitality. And processed foods are chemical cuisine. These little tips for staying connected to Mother Earth (pachamama have a side effect . . . they improve your health. Research has proven that being outdoors improves health. Honoring the earth helps put us in touch with our Spirituality — helps us learn to trust our inner voice of inspiration. 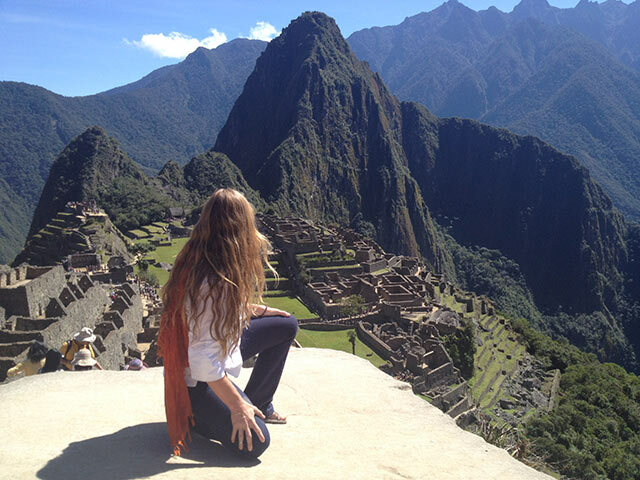 Walk barefoot on panchamama and breathe deep. Give your thanks and ask your questions. 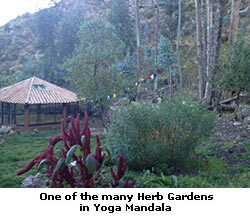 Earth centered teachings and practices like this are as old as the hills and vitally important for our healing. 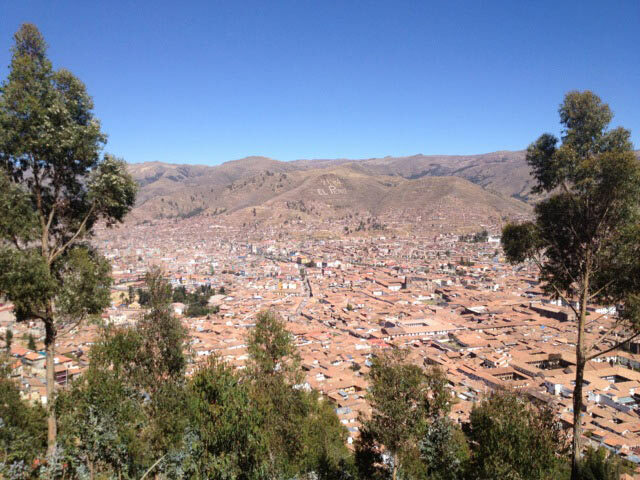 Another aspect I liked in Peru is that there are still people to help and guide you instead of electronics. Being a world traveling and having to figure out bus and tram and mass www.healthandrecoveryinstitute.com/adderall-adhd/ transit schedules I really appreciated the bus people in Lima. They have a guy who hangs out the bus door while its driving down the road, as it pulls up to the curb he hops out and greets you and tells you where the bus is going. You can also ask him to have the bus stop anywhere along the way. When you sit down, he comes to collect your money and gives you your ticket — and he knows where you want to get off. So much sweeter than going to a computer that is in a different language, punching some buttons to get my ticket hoping it is the correct one, then feeding it to a machine on the bus or tram hoping I got on the one going in the correct direction, then sitting there watching the map and hoping I am getting off at the right place . . .
For Traffic signals they still use a person to direct traffic. Which is better as he/she can see which areas are getting backed up and adjust the flow of traffic accordingly. And in Peru they still have people who come to help you with housework. Most people have someone come every other day, they help you with your kids, cooking, laundry, cleaning . . . I would love that. They become part of your family, you eat your meals with them on the days they are there and share your lives. In the apartment houses there is usually one man who works there during each day, he sits and reads his paper just waiting to be of assistance. He helps you to your car, helps you carry things out of your car, you can bring your trash down to him to take out, and he keeps the place secure and clean. 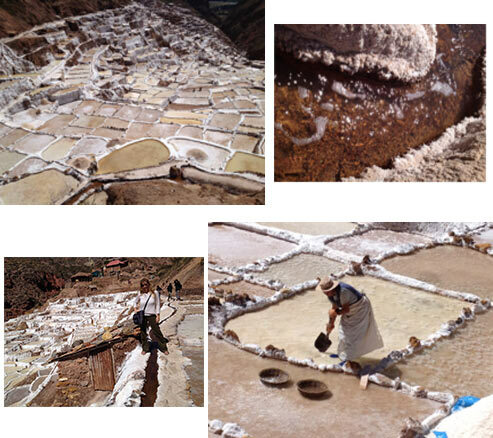 In the Sacred Valley there are the Maras salt mines, salt is still mined here as it has been for 100s of years by families. Its very cool, there is highly salty water that emerges from an underground spring. It is so salty, where the water flows the banks are crusted with salt. The Incas very carefully built little ponds and channeled the salty water to these pools. They built them so the water flow can be controlled, there is a little notch in the side wall of the pond, farmers allow the water to flow through, when the water reaches a certain depth they plug the notch and allow the water to evaporate. Then take the salt, bag it and sell it. Various families own various salt pools and the families go together and work the ponds. 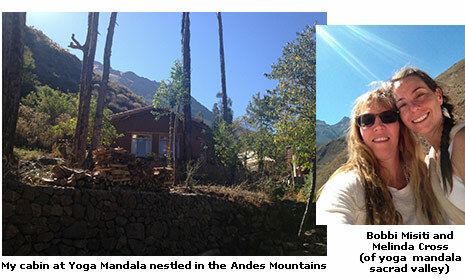 Also in the Sacred Valley, they were digging ditches to lay pipe – of course this was done by people not machines. They were mostly toothless –both men and women digging — but all grinning and happy. When I walked by there were so friendly and called me over, Hola Senora . . . chicha da hora? Offering me their home brewed corn drink called chicha. Very sweet people. Although every time I walked by they seemed to be taking chicha da hora . . . however they got the work done so quickly. Maybe because there is not any black top, just dirt and rocks for them to dig through . . . I compare that to the work that was done on the road (Market Street in Camp Hill) this past spring outside my studio. When I walked by people would smile and wave, but we could not talk over the roar of the machines. And heaven forbid if they stopped working to talk with a stranger . . . probably would have lost their job or received a demerit of some type . . . I guess I get a little of this people instead of electronics from my Dad; he insisted that in his business the phones always be answered by a real person. No electronic answering machines! When you call his business you get a live person. And we have sweet people energy here too . . . I got to the airport for this trip — going to Miami first to be with my sister I was not thinking about what I would need to get to Peru from Miami . . . I got to the Harrisburg airport and realized I forgot my passport! My flight was delayed by 40 minutes so I called my son and got him out of bed (he grumbled ooohhhh mom!) . . . but he got up, he ran to my house, got my passport, ran it to me at the airport. By this time my flight was boarding, a TSA guy told me to go through security awhile and he will run down to get my passport from Anth, so I did and waited anxiously as I was on the phone with Anth — 2 minutes away and my plane is all boarded . . . the woman taking the boarding tickets knew my predicament and stalled for me In just a nick of time the TSA guy got my passport from Anth, ran it up the steps and through security to my hands and I ran on to the airplane. Whew. I could not have done that with out the wonderful people energy of my son, the TSA guy, or the woman who stalled closing boarding for the plane.